Newsletter February 4, 2019: Problem identified: no indication easy fix is coming soon. “Oak Bay Watch Doesn't Make Up the Facts - It Just Reports Them”. Identified at a Committee of the Whole Meeting July 16, 2018, Agenda Item # 3: Architectural Siting and Design (ADP00078) - 237 King George Terrace. The Council chair stated that the King George Terrace siting and design application was part of a 4-lot subdivision and “The subdivision is not part of this application: the subdivision has already been dealt with. The application is for siting and design of two individual houses”. architectural drawings of the entire project. In effect: seek Council, Advisory Planning Commission, and Heritage Commission approval and neighbour viewpoints without providing them with what the completed subdivision will look like, how it will impact adjoining properties and fit the streetscape or neighbourhood. This was the process used to approve the King George Terrace subdivision referenced above and a number of quite recently approved subdivisions. In the case of the King George Terrace subdivision, neither the developer, nor the District, notified neighbours about the subdivision application. The neighbours only learned about the 4-lot subdivision many months later when Oak Bay Watch informed them about the subdivision application. At this point the Oak Bay Watch also learned the District had granted preliminary approval in April 2017. Obtaining further information and residents providing input proved to be difficult, even though the proposed subdivision was in their residential area, adjacent to a park, on a scenic route, directly on the shoreline and in one of the most sensitive environmental zones in BC with a Federal bird sanctuary. As indicated above, the District moved 4-lot subdivision forward without providing many of the details, including what the four proposed houses and any accessory buildings would look like. It was not until July 16, 2018 many of the subdivision reports, some commissioned by the developer, were finally released to the public. In the process, several important potential benefits for the community were overlooked. See another subdivision process example: Appendix #1 Council Report Council, Committee of the Whole January 21, 2019). “Plans* must also include a statistical table of the proposal covering all of the conditions of use for the applicable zoning district, plus the variances being requested. The table must include required/permitted and proposed yards and setbacks, density, floor space ratio, site coverage, height, parking and loading requirements, balcony and open space dimensions and areas, housing unit types and areas, and areas set aside for common areas (if applicable) should also be noted. Any bylaw deficiencies should be noted”. As stated, it is a reasonable expectation for the Public and Council to see what the entire project will look like, and have the necessary reports and details, before being asked to provide their viewpoints and give approval. It is difficult to understand how the present undisclosed, non-transparent subdivision process could have been adopted in the first place. How could it have been left uncorrected for so long given all of the push-back from residents and Council members? Unfortunately, these types of developments override the zoning bylaw, so it is up to the District Approving Officer to satisfy the requirement to balance the public interest with the developer benefits. It is not clear how this can be adequately assessed without most of the above information, including not knowing what the completed subdivision will look like. On November 13, 2018 at their monthly meeting, when considering a subdivision application the Heritage Commission pointed out to the Director of Building and Planning, the Manager of Planning, and to the Planner, that they were unhappy with the limited information and short notice they were receiving on these developments. The draft November 13, Commission minutes provided to Council on December 10, 2019, to consider the same subdivision application, did not reflect the Commission’s concerns. The Zoning Bylaw that allows over-building has not been corrected and it is obvious that many new house developments are excessive given the lots they occupy. This results in much more lot coverage, more paving runoff, urban forest loss and impacts on the infrastructure. It is evident that this overbuilding will apply even more to houses on 4-lot subdivisions that can have smaller lots and fewer restrictions. Even the contentious Bowker condo proposal presented residents and Council with an artist’s rendition of the development, providing some idea of what to expect. While the in-process Bowker Project at Cadboro Bay Road is already much more sizable "in person” three current Council members who anticipated this outcome, wanted to significantly reduce the density, and voted against approval. We expect that, when finished, the massing and lack of setback will produce more adverse comment. Our New Mayor and Council certainly cannot be held responsible for a development process as "out of sync" as this one. However. in the short time they have been in office, they have had experience with 2 Heritage Revitalization Subdivision applications and are aware of the public's serious concerns on these and other similar subdivisions. One of these was discussed recently for four-hours at a Council meeting session. It is Oak Bay Watch’s opinion that approval (or a request for approval) without revealing what is to be approved is not a transparent process or the basis for sound decision-making. Council has been provided with the information, an excellent subdivision approval format and there are adequate planning staff to prioritize setting the necessary remedial policy and guidelines. There appear to be no barriers to implementing a subdivision process and practice that are in the best interest of Oak Bay residents. Agenda Item #4: Development Variance Application (DVP00089) - 638 Beach Drive. The “architectural siting” is to one of three new houses to be built on a subdivision. Although The subdivision is in an RS2 residential zone however the Planning Report indicates less restrictive RS4 zoning rules. In addition a number of additional variances were recommended. The subdivision had been endorsed by Council four months earlier, on September 18, 2017. 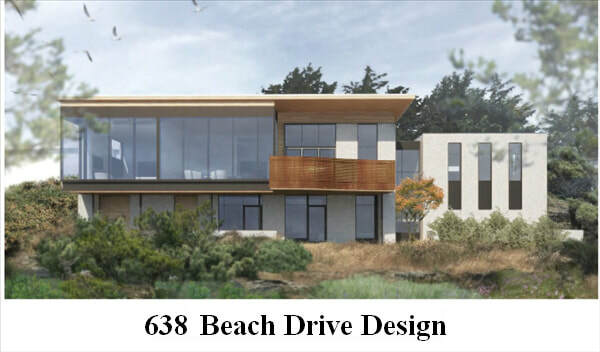 The January 11, 2019 Report of the Manager of Planning states: “The District of Oak Bay is in receipt of development variance permit and architectural siting and design applications to construct a single family dwelling at 638 Beach Drive. The proposal requires varying the provisions of the Zoning Bylaw No. 3531”. The Planning Reports (September 1, 2017 and January 11, 2019 differ in the Planning Department's assessment of tree preservation. The initial September 1, 2017 Manager of Planning Report stated; “Staff do not anticipate the targeted tree canopy cover can be met given that site conditions such as predominant bedrock, water drainage, and topography will make it difficult to achieve any significant tree growth”. While the January 11, 2019, Planning Report now states: “While the rocky terrain and proximity to the ocean will result in a reduced mature size for all of the proposed trees, the number of trees being planted will generate an estimated canopy cover of 50%, exceeding the 35% target established in the Urban Forest Strategy”. The Report explains; “part of the subdivision process is to determine an appropriate building envelope while protecting the site in its natural state as necessary”. Note: Most of the trees on the property have been removed (see Appendix #3) and much of the green space and soil that absorbs rainwater will be built or paved over. The Heritage Commission gave their approval in July 2017 before Council without being provided with the Sept 2017 Planning Report or a preview of the buildings. 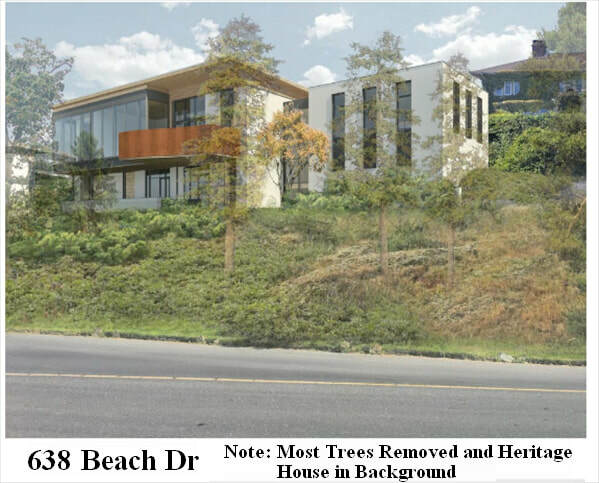 Commission members recommended approval of this Beach Drive scenic route subdivision however, with the condition “the design of the new homes must reflect the sprit of the heritage (house) designation”. The new variance request is for a variance to increase the original variance. Council members raised concerns and stated the new design was not what they expected: however, only Councilllor Zhelka voted against the application. The new variance, the design and siting were approved as some Council members rationalized there were other box type houses near that location. While it is true there are other box type houses in the vicinity, they are older and likely built to the more restrictive RS2 zoning rules. 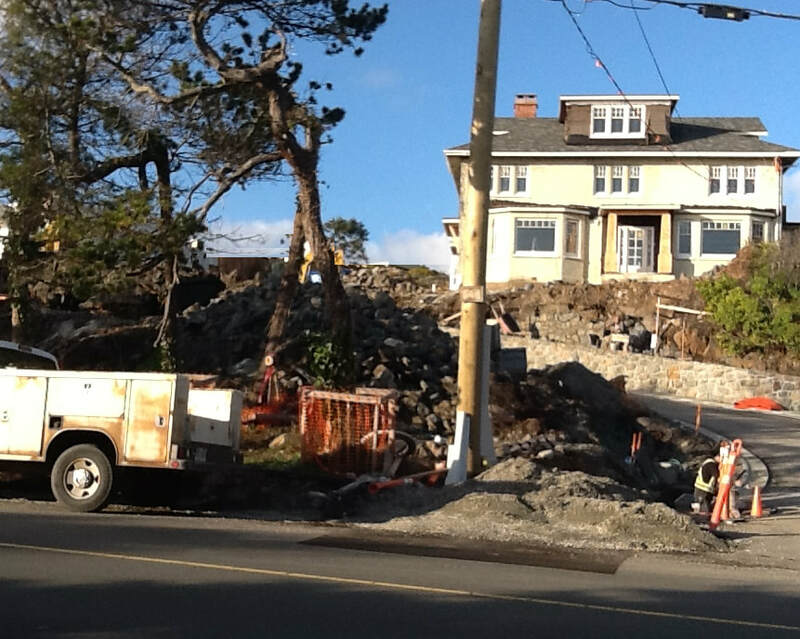 Also, they are set well back from the road and have the same significant tree coverage that has been removed from the streetscape of 638 Beach Drive subdivision. The design most certainly does not “reflect the spirit of the heritage designation” as recommended by the Heritge Commission. The Planning Staff however, who attend Heritage Commission meetings informed Council that they, “consider the proposed development, including variances, to be supportable”. Note: In resent Council terms assembling land to create subdivisions in Oak Bay's single -family neighbourhoods has also been problematic. This subject will be discussed in a future newsletter. Guiding principle for Heritage Revitalization Agreements (HRAs): Ensure HRA policy is integrated with other important City policies. Ensure HRAs are used appropriately and they balance both public and private benefits. corners of site, plus other elements as required.